For those of you who read my blog on a regular basis, you’ll notice the number of weekly posts has dwindled, in addition to there being a lack of recipe posts. I’ll admit, my life has gotten busier over the past couple of months. I know this isn’t a great excuse, but it is true nonetheless. I also have been slacking on my recipe experimentation, typically throwing together sandwiches and salads for lunch and scrounging for leftovers for dinner. Thankfully, I am fortunate to have a few people in my life that do cook for me sometimes. Who doesn’t just love when someone says, “I’ll make dinner tonight! You just relax.” I know I can’t refuse an offer like that. Ever. So, when I was told the other day that I’d be served chicken wings for dinner, I was thrilled knowing they would be homemade. Homemade = Healthier, perfectly sauced wings. Sorry guys — Buffalo Wild Wings is just not my thing. As I watched the preparation of the homemade wings, I was overly-excited to give them the ultimate taste test. I could barely wait until the wings were cool enough to eat. 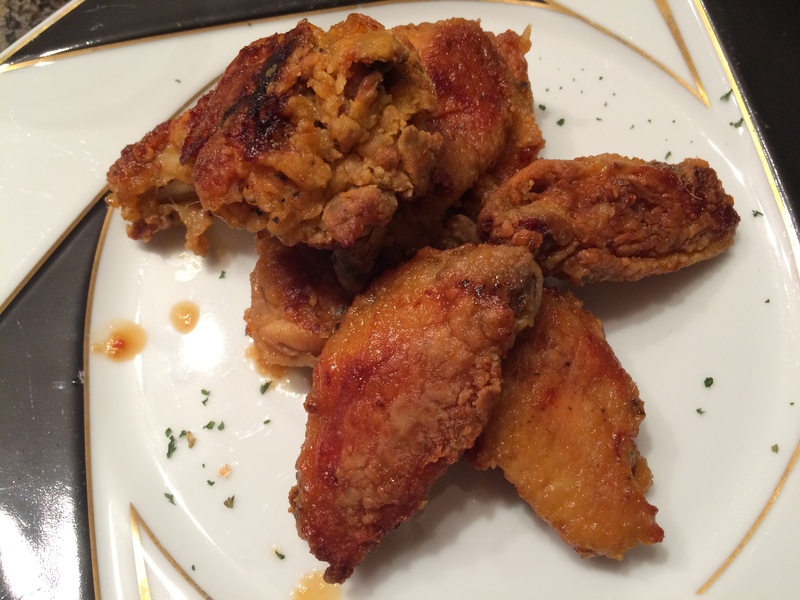 Finally, I was permitted to take my first bite of a drumstick, and I was amazed that oven-baked wings could be so perfectly golden-brown and crispy! They had a tangy and spicy outer layer, coated with a garlic and ginger-based sauce. The meat itself was deliciously tender. Napkins or wet wipes are definitely a must. Ideal for a tasty dinner or snack, and even for Mother’s Day if you’re momma loves wings, this recipe will satisfy every time. Even if you’re stuck making them on your own, the preparation is pretty easy, and the oven does most of the work. While I credit the chef who made these for me, I also have to give ample applause to Chef John, creator of the blog FoodWishes.com, for the recipe. If you haven’t checked out his blog yet, that should be your next stop after reading mine! 4. Pour a few tbsp of Frank’s hot sauce over chicken. 5. Drizzle the vegetable oil over chicken. 7. Add wings to pan. Spray an extra layer of cooking spray onto wings for added crispiness. 8. Cook wings for 30 minutes and then turn over, then bake for another 30 minutes. 9. While the wings are getting nice and golden, you can start on your sauce. In a small pot, add some crushed garlic, Sambal or hot pepper flakes, brown sugar, ginger, rice vinegar, and soy sauce, and bring to a boil. 11. When the wings are done, pour half of the sauce onto wings. Let wings cool for several minutes (this is the hard part) before digging in! I am NOT a chicken wings fan, but these look delish. Love your posts! I’m not a huge fan either, but these are definitely a game changer. Thanks, Fred!